This is the first in a series of spotlights on our spring 2018 student interns. Learning Life’s students this spring are assisting with research, outreach, fundraising, and international family-to-family projects focused on community photography and food culture as part of our Citizen Diplomacy Initiative (CDI). 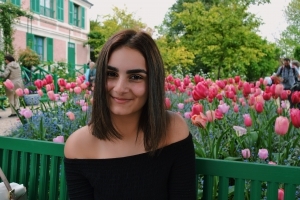 Arielle Mobayen, interviewed below, is helping with outreach to international organizations, fundraising, food culture research transcriptions into French and English, and the family food culture project. I was born in Scottsdale, Arizona of Iranian parents, but I was raised mainly in Paris. Most of my family lives in California, so we visited them during the summers, but otherwise I lived in Paris with my family until age 16. Then at 16 onward, I lived mostly in California until college. I attended the American University of Paris for my freshman year of college. I transferred to George Washington University in my sophomore year, and will be graduating in 2020 with a major in International Affairs and Criminal Justice. I spend most of my free time reading, especially during the summer. I love reading different kind of fiction and non-fiction books that help me learn new things. I also enjoy playing the piano and improving my piano skills. One life experience which has shaped me thus far is the move my family and I made from Paris, France to Orange County, California when I was 16 years old. Living in a European country is very different from living in southern California. Most of my friends were in Paris and as I was used to the French education system, so a lot changed when my family moved to California. Still it was an amazing experience which made the multi-cultural person I am today. If I did not move to California, I probably would not be at George Washington University now, so I am very thankful for this cross-cultural opportunity. My professional goal is in the long run is to work with the U.S. Government or with any international government agency to expand my experience and skills in International Affairs and Criminal Justice. A dream of mine would be to use my language skills (I speak Farsi/Persian, English and French fluently) to work with the FBI or the CIA. I chose to intern at Learning Life as a way for me to expand my global experiences. I do this by working with different Learning Life families in Washington DC and Dakar, Senegal. I am able to help spread learning with children and work on international projects, which I love. The most beautiful place I have seen on earth is the Amalfi Coast of Italy. The landscape is just amazing — sandy beaches, clear blue sea water, homes of different colors, mountains, etc. It looks like the beautiful photos one sees on tourist postcards. There are a few islands where you can spend a day touring if you take a boat. On top of that, the Italian people and their food are incredible!